Guest: Marguerite McDonald, MD (New York, NY), Ophthalmologist and LASIK pioneer. LASIK pioneer and ophthalmologist Marguerite McDonald, MD, appeared as Sharon Kleyne's guest on the Sharon Kleyne Hour - Power of Water radio show. She presented information about dry eye disease, especially as it relates to inflammation of the eyelid and blepharitis, which are frequently overlooked in dry eye research. According to Dr. Marguerite McDonald, 20 to 30 million people in the United States show symptoms of early stage dry eye disease. Six million US women and three million men suffer from chronic dry eye. The incidence of dry eye increases with age. Dry eye is also a side effect of numerous medications. Modern, climate controlled, energy efficient buildings can also contribute to dry eye. Computers also contribute to dry eye. When working at a computer, the eyes' natural blink rate may drop from 20 to 40 times a minute to three times a minute. Other factors that can dehydrate the eyes' tear film include arthritis, gout, eye surgery, poor nutrition, not drinking enough water, low thyroid, not enough sleep, contact lenses and topical eye medications. Eyelid blink disturbance cause by strokes and other diseases can also result in dry eye. A disease called "blepharitis" which is inflammation of the eyelids, can also contribute to dry eye symptoms. The eyelids are home to the meibomian glands, which secrete oil (lipid) onto the tear film. This oil, among other things, prevents the water in the tear film from evaporating. Should eyelid inflammation affect the proper functioning of the meibomian glands, as it often does, the tear film water evaporation rate can increase dramatically, resulting in dry eye disease. Dry eye symptoms can include: A need to go to bed earlier, difficulty reading, anxiety/depression, increased eye allergies (since the eye can't wash away allergens as easily), sensation of dryness, redness, fluctuating vision, tired eyes, etc. If the problem is worse at the end of the day, it's dry eye, if it's worse in the morning, it's more likely blepharitis. Burning is a symptom of blepharitis. With no treatment, chronic dry eye and blepharitis will usually get worse over time. A drug called Restasis can help the eye's lachrymal glands produce more and better natural tears. This is extremely helpful in treating dry eye symptoms. In addition, I strongly recommend Nature's Tears EyeMist, an all-natural eye mist product from Bio-Logic Aqua Research. 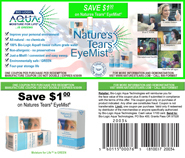 Nature's Tears EyeMist is the only eye care product that supplements lost tear film water without washing away the tear film's lipid layer or other beneficial components. Marguerite McDonald recommends annual ophthalmologist visits beginning at age 40. She also recommends newborn infant vision checkups and periodic well-baby vision checks. The American Academy of Ophthalmologists has excellent programs for children at www.GetEyeSmart.org. Sharon Kleyne's evaluation: Dr. Marguerite McDonald is a dedicated ophthalmologist and educator, and a world leader in her research specialty. She always seems to offer a different perspective and give us new information. She is an advocate of a healthy, proactive lifestyle, excellent nutrition with natural dark green vegetables, plenty of sleep and exercise, and drinking sufficient water.